From the creator who brought you the fintastic Crazy Shark! Itay G, the evolution has begun as he presents to you Crazy Shark – Dolphin edition. 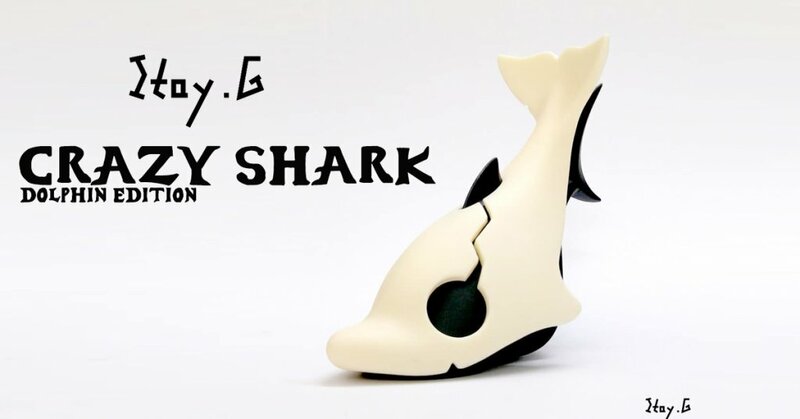 Industrial designer Itay Gdalyahu AKA Itay G has come up with another take on his resin Crazy Shark silhouette and it looks cool in our opinion and having the freedom of two looks rolled into one figure. Dolphin edition first made its debut at Dcon 2017 and no surprise they sold out! Now it’s your chance to own one. But be QUICK if you want to catch one as there’s not much time left as the 24-hour window is about to shut. Price: 60$ + Free shipping! Contact Itay via Facebook HERE. Itay G has a spanking new website too http://www.itayg.toys/.